The ACORD Board continues to be chaired by J. Spero Zacharias and consists of 27 members, including nine new Directors. 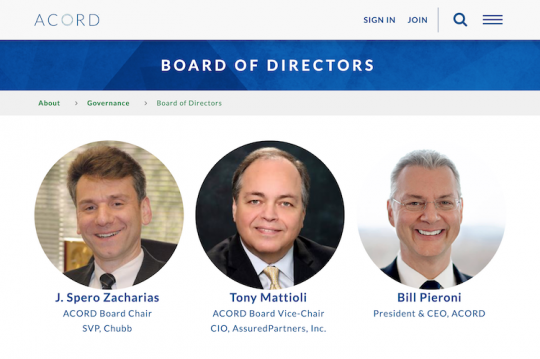 ACORD (Pearl River, N.Y.), the global standards-setting body for the insurance industry, has announced its 2019 Board of Directors. The ACORD Board continues to be chaired by J. Spero Zacharias and consists of 27 members, including nine new Directors. Steven Beard, Chief Executive Officer, Risk Transfer Group & RFIB (London). Steven Beard was appointed as Risk Transfer Group CEO and RFIB CEO in May 2018. Beard joined the Group in December 2017 as its CFO and CEO of George Yard Services (a newly created central services company). Prior to this, Beard served as Group CEO of technology and professional services company, Agilisys. Beard has also served as CO of Redwave plc, a U.K. based venture capital firm. He began his career working for a series of Lloyd’s managing agents including Navigators, Brockbank and XL Capital. Beard is a Fellow Chartered Certified Accountant. Kirk Behrens, Global Chief Operating Officer, Aon Health Solutions. Kirk Behrens, Global Chief Operating Officer, Aon Health Solutions (London). Behrens is responsible for developing and executing the strategic direction for global technology and operations at Aon Health Solutions. 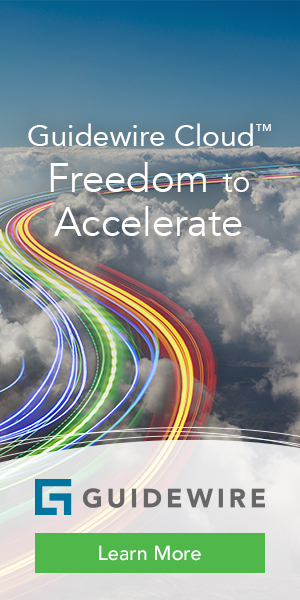 Additionally, Behrens chairs Aon’s Global Operations & Technology Council. 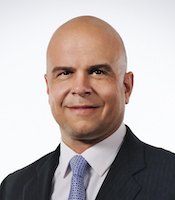 Prior to his current role, Behrens held various senior leadership positions within Aon’s Commercial Risk Solutions business and its global technology organization during his more than 10 years with the firm. Prior to that, he held strategy, operations, and technology leadership positions at Marsh and was a management consultant at Accenture. Helen Crooks, Chief Data Officer, Lloyd’s of London. Crooks is a Champion for Data for the London Market within the Target Operating Model Programme, and has 30 years’ experience setting data strategy and creating data insight solutions across a range of markets including FMCG / Retail, Telecoms, Publishing, Travel and Financial Services. Crooks was the Chief Architect and Technical Director for Dunnhumby, and has subsequently enabled several major European organizations to effectively manage and utilize their customer data. Crooks started at Lloyd’s in August 2015, leading developments around Data Governance, AI and Cognitive Intelligence, new data technology and a data literacy program designed to ensure Lloyd’s has skills and expertise for the future. 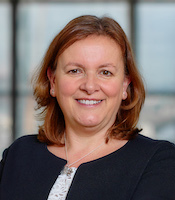 Helen Crooks, Chief Data Officer, Lloyd’s of London. Kevin Kennedy, Chief Information Officer, Prudential Financial (Newark, N.J.). 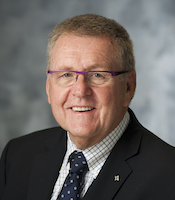 Kevin Kennedy is Vice President and Chief Information Officer of various Corporate Centers; inclusive of Law, Compliance, Business Ethics & External Affairs, Global Marketing & Communications, Long-Term Care, Investor Relations, Operational Risk, Audit, and Electronic Records. Prior to joining Prudential, he served as Managing Director and Chief Technology Officer at Jefferies, where he was responsible for the technology supporting the Investment Banking Division’s OneJef platform. Kennedy was also Chief Information Officer for the Prudential Bache. Patrick Molineux, Managing Director LIMOSS, London Insurance Market Operations and Strategic Sourcing. 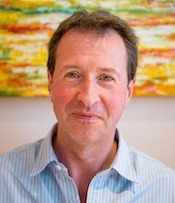 Patrick Molineux is the Managing Director of LIMOSS, London Insurance Market Operations and Strategic Sourcing. LIMOSS was established by Lloyd’s of London, the International Underwriting Association and Lloyd’s Market Association to source and operate the Market Services used to support the London Insurance Market. Molineux previously worked at CSC Computer Sciences Corporation, where he was most recently general manager responsible for CSC’s insurance business in the U.K. Over his 20 years with CSC, Molineux held roles including running CSC’s global insurance strategy, management consulting, sales and program management. Dr. Ralf Schneider, Executive Vice President and Head of Global Operations, Allianz (Munich). Schneider has been the Group CIO of Allianz since October 2010. Dr. Schneider is also a former Board Member for IT of Allianz Technology SE and acted as the CIO of Allianz Deutschland AG, and holds various mandates in different Cyber Security related organizations such as the Cyber Security Sharing & Analytics e.V., the Deutsche Cyber Sicherheits Organization and the Digital Society Institute of the ESMT in Berlin. He is the Vice Chairman of the Federal Association of IT users, a curator at the Fraunhofer Institute for Applied Information Technology, a senator of the National Academy of Science and Engineering, a founding member of the Industrial Data Space e.V. Patrick Molineux, Managing Director LIMOSS, London Insurance Market Operations and Strategic Sourcing. Simon Squires, Senior Operations Lead, UK & Ireland, International & Premium Collections, Middle Office XL Catlin, AXA XL (Hamilton, Bermuda/Stamford, Conn.). Squires has been the Chairman of Ruschlikon UK for the past seven years, helping to facilitate implementations of ACORD Standard messaging across a wide community of brokers, insurers, and reinsurers. Squires is currently the U.K./ROI Senior Operations Lead for Premium Collections and International. He has previously held roles at IBM HUON, implementing insurance systems, RSA, in operations and finance, and PWC, working in London and internationally for insurance and financial services clients. James (Jim) Tyo, Chief Data Officer, Nationwide (Columbus, Ohio). Jim is the enterprise Chief Data Officer for Nationwide. He is responsible for overall strategic vision, planning, execution and management of all activities related to operation of the Enterprise Data Office (EDO) for Nationwide. Tyo formerly worked at BB&T, one of the largest financial services holding companies in the U.S., where he was their first enterprise CDO, and USAA, a member-owned association dedicated to providing financial services to the military community and their families, where he began their first Chief Data Office. Prior to USAA, Tyo held senior positions within GE Capital and Key Bank. Rafal Walkiewicz, CEO, Willis Towers Watson Securities (London). Walkiewicz is CEO of Willis Towers Watson Securities. He joined Willis Towers Watson in 2014. He brings over 20 years of international experience working with financial institutions such as Goldman Sachs, and in particular insurance companies. Walkiewicz started his career at BMT Brokers, where he managed one of the first Polish independent stockbrokers, asset managers and investment banking boutiques. Walkiewicz earned his M.Sc and Ph.D. in applied economics from Warsaw School of Economics and an MBA from Harvard Business School. Spero Zacharias, Board Chair, Senior Vice President, Chubb.